At about 11:15 a.m. on July 10, 1945, a U.S. Navy B-26 aircraft took off from Bedford Field in Bedford, Massachusetts, with five men aboard. 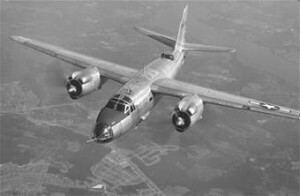 The B-26 aircraft was generally used by the Army Air Corps, however this particular airplane had been assigned to the navy. The purpose of the flight was reported in the press to be “experimental”. Shortly after take-off one of the engines caught fire causing the aircraft to rapidly loose altitude. Witnesses on the ground reported seeing flames and smoke trailing from the plane as it went down. The aircraft crashed and exploded on the Jensen Farm on Old Sudbury Road in the town of Lincoln. All aboard perished. One of the flyers reportedly bailed out prior to the crash and was found, severely injured, by a group of boys who carried him to a nearby home where he died a short time later. Lt. William E. Ragsdale, of Artesia, New Mexico. Lt. James Thomas Hogan, 26, of Birmingham, Alabama. He’s buried in Elmwood Cemetery in Birmingham. See www.findagrave.com, memorial #185466812. AMM 1/c Edwin T. Luther, of Bristol, Rhode Island. AMM Howard T. Marshall, age 22 or 23. He’s buried in Oakland Cemetery in Moberly Missouri. See www.findagrave.com, memorial #70597092. AMM 3/c Charles P. Rogers, of Sudbury, Pennsylvania. Concord Journal, “Plane From Army Air Base Crashes In Woods In South Lincoln Area”, July 12, 1945, page 1.